Minnesota Timberwolves big-man Nikola Pekovic left in the first quarter on Monday night against the Chicago Bulls with a right ankle injury. An MRI performed on Tuesday showed bursitis of the ankle and the team announced he will be sidelined for 7-10 days. This means Pekovic will miss at least the next 4 games and maybe even up to 7. The Timberwolves are 3 games out of the last playoff spot as we come to the midpoint of the season and losing him is a big blow since he is third on the team in scoring and second in rebounds and field goal percentage. The team lacks depth at the center position and will look to Ronny Turiaf to start at center. Besides Kevin Love and Turiaf, the only other player above 6’10” on the roster is Gorgui Dieng, who has appeared in 25 of the 44 games this season and averages 5.4 minutes per game. 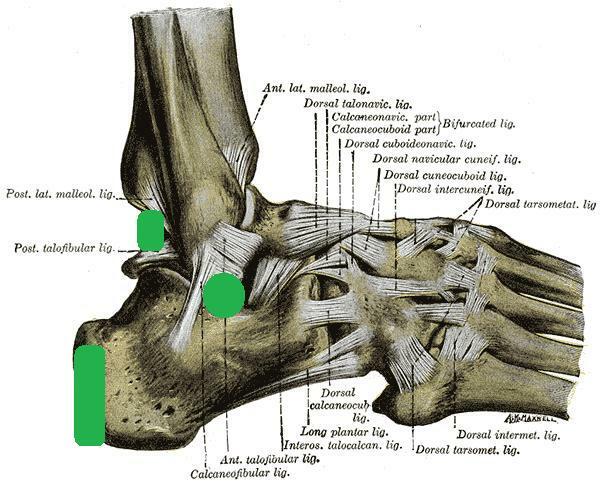 No specific bursa was named in Pekovic’s injury but there are three common areas where ankle bursitis can occur, as represented by green in the picture above. Going from left to right in the picture, there is the subcutaneous calcaneal bursa, the retrocalcaneal bursa, and the subcutaneous bursa of medial malleolus. The first often becomes inflamed when there is an injury to the Achilles tendon or with tight fitting shoes. The second bursa can develop inflammation with overuse of the ligaments, tendons, and ligaments around it especially in sports such as soccer and basketball. The last bursa listed is often injured with trauma or contact sports, causing severe pain with dorsi and plantar flexion of the foot. Typical treatment consists of rest, ice, and shoe inserts to help cushion and stabilize the ankle. Corticosteroid injection into the bursa can help decrease inflammation. Surgery is usually not required. Ronny Turiaf will start at center while Pekovic is out. Turiaf finished the game against the Bulls on Monday night with 14 PTS, 7 REB, and 3 BLK on 6-7 shooting in 32 minutes. He had been averaging 15.6 minutes per game in his last 10 games so more playing time will boost his value in most standard leagues. Kevin Love might see a spike in points and rebounds as he becomes the lone threat in the low post for the T-wolves.